We are having a great revival at Bible Holiness Church in Elkton, Virginia. Odie is taking lots of pictures and we plan to post them tomorrow morning. We are having a difficult time with the final plumbing inspection on the house being built for Odie to live in. I am sure it will be taken care of, but it makes me nervous because of the schedule we need to meet next week. My Dad is dealing with the plumber and inspector handling most of the leg work. I appreciate that so much. I can not imagine what I would do without his help. 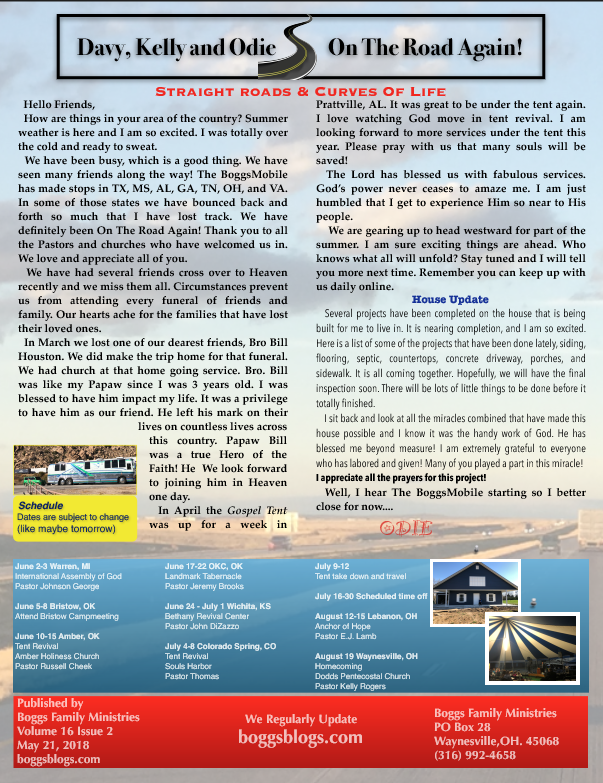 Odie's On The Road Again newsletter was mailed this week. Some times I forget to post it here and I was about to let it slide this time. Thanks to Odie's reminder, here it is. I hope you can read it. For more of the schedule you can click HERE.